Yet despite these encouraging numbers, it turns out hiring challenges lie ahead for manufacturing employers. Those three million jobs to be created over the next ten years? 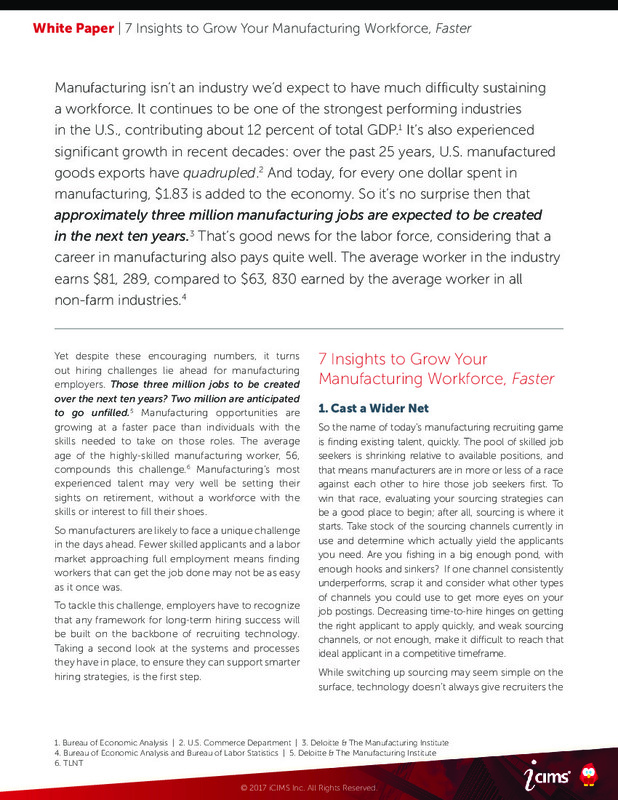 Two million are anticipated to go unfilled.5 Manufacturing opportunities are growing at a faster pace than individuals with the skills needed to take on those roles. 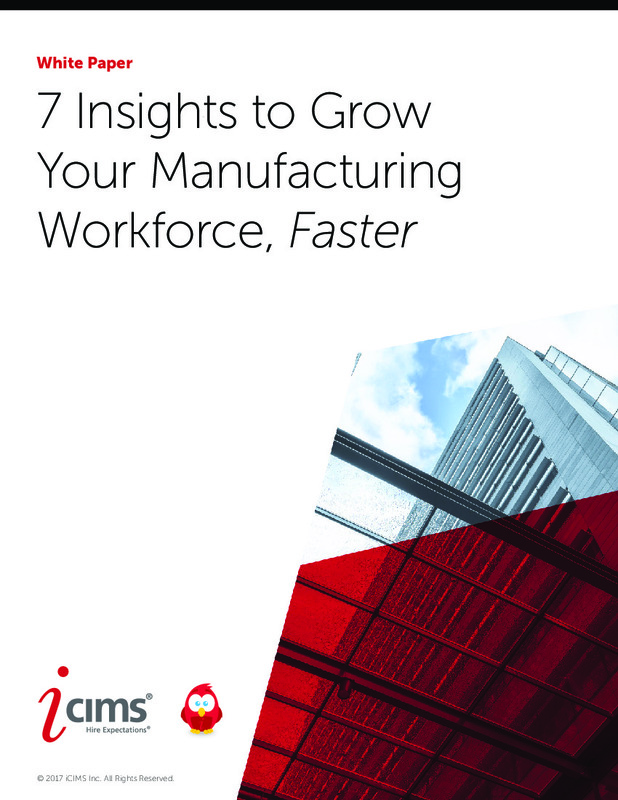 The average age of the highly-skilled manufacturing worker, 56, compounds this challenge.6 Manufacturing’s most experienced talent may very well be setting their sights on retirement, without a workforce with the skills or interest to fill their shoes. So manufacturers are likely to face a unique challenge in the days ahead. Fewer skilled applicants and a labor market approaching full employment means finding workers that can get the job done may not be as easy as it once was. To tackle this challenge, employers have to recognize that any framework for long-term hiring success will be built on the backbone of recruiting technology. Taking a second look at the systems and processes they have in place, to ensure they can support smarter hiring strategies, is the first step. So the name of today’s manufacturing recruiting game is finding existing talent, quickly. The pool of skilled job seekers is shrinking relative to available positions, and that means manufacturers are in more or less of a race against each other to hire those job seekers first. To win that race, evaluating your sourcing strategies can be a good place to begin; after all, sourcing is where it starts. Take stock of the sourcing channels currently in use and determine which actually yield the applicants you need. Are you fishing in a big enough pond, with enough hooks and sinkers? If one channel consistently underperforms, scrap it and consider what other types of channels you could use to get more eyes on your job postings. Decreasing time-to-hire hinges on getting the right applicant to apply quickly, and weak sourcing channels, or not enough, make it difficult to reach that ideal applicant in a competitive timeframe. While switching up sourcing may seem simple on the surface, technology doesn’t always give recruiters the ability to be nimble on this front. Manufacturers need a system that lets them efficiently configure sourcing strategies on a per-job basis. Does your current recruiting system automatically post to major job boards? Do you have the ability to quickly pull reports on the performance of those boards? How many job boards does your system provide access to? If you wanted to reach a niche audience (let’s say, a job board targeted to computer engineers), could you? Increasing exposure on job boards can make a difference, but the impact may well be two-fold when employers invest in a strong presence on diverse social media channels, too. Just like job boards, recruiting software can automatically publish job postings to your preferred social media channels. One click, set-it-and-forget-it automation saves recruiters the hassle of redundant posting, while still expanding the employer’s job seeker reach. Social may not always seem like a natural place to recruit, but it’s where today’s job seekers are looking. Manufacturers can get another leg up with a hiring manager approval process that’s convenient, collaborative, and as a result, more efficient. The hiring manager review is typically the longest part of the hiring process, and when hiring managers spend their days on the floor, on a work site, or in transit away from their computers, finding an opportunity to address HR requests can be difficult. Reminder emails from recruiters (that end up on the desktop hiring managers are away from anyways) don’t always help matters, either. 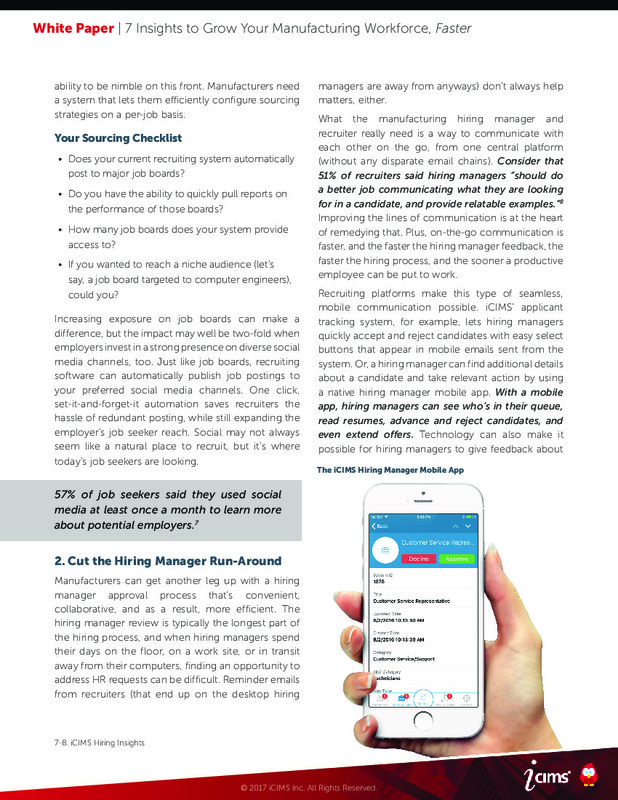 What the manufacturing hiring manager and recruiter really need is a way to communicate with each other on the go, from one central platform (without any disparate email chains). Consider that 51% of recruiters said hiring managers “should do a better job communicating what they are looking for in a candidate, and provide relatable examples.”8 Improving the lines of communication is at the heart of remedying that. Plus, on-the-go communication is faster, and the faster the hiring manager feedback, the faster the hiring process, and the sooner a productive employee can be put to work. Recruiting platforms make this type of seamless, mobile communication possible. iCIMS’ applicant tracking system, for example, lets hiring managers quickly accept and reject candidates with easy select buttons that appear in mobile emails sent from the system. Or, a hiring manager can find additional details about a candidate and take relevant action by using a native hiring manager mobile app. With a mobile app, hiring managers can see who’s in their queue, read resumes, advance and reject candidates, and even extend offers. Technology can also make it possible for hiring managers to give feedback about candidates and interviews right within the candidates’ profile. This means information is stored in one location that recruiters and hiring managers can refer back to throughout the hiring process. The fact that the average skilled manufacturer is 56 should be the employer’s call to action to increase investments in university recruiting. Manufacturers need to attract more young people if they hope to make up for the oncoming bubble of retirees. While an employer can only control so much, they can and should connect with potential applicants where they are: college campuses. This means giving university recruiting the tailored experience it deserves. Take a photo of their resume as they register from the mobile device at the event. 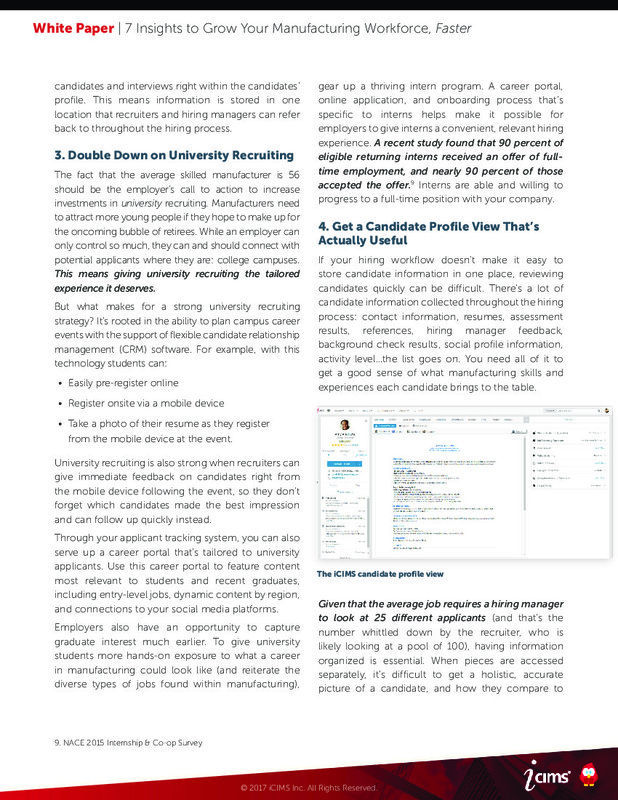 University recruiting is also strong when recruiters can give immediate feedback on candidates right from the mobile device following the event, so they don’t forget which candidates made the best impression and can follow up quickly instead. Through your applicant tracking system, you can also serve up a career portal that’s tailored to university applicants. Use this career portal to feature content most relevant to students and recent graduates, including entry-level jobs, dynamic content by region, and connections to your social media platforms. Employers also have an opportunity to capture graduate interest much earlier. To give university students more hands-on exposure to what a career in manufacturing could look like (and reiterate the diverse types of jobs found within manufacturing), gear up a thriving intern program. A career portal, online application, and onboarding process that’s specific to interns helps make it possible for employers to give interns a convenient, relevant hiring experience. A recent study found that 90 percent of eligible returning interns received an offer of full-time employment, and nearly 90 percent of those accepted the offer.9 Interns are able and willing to progress to a full-time position with your company. If your hiring workflow doesn’t make it easy to store candidate information in one place, reviewing candidates quickly can be difficult. There’s a lot of candidate information collected throughout the hiring process: contact information, resumes, assessment results, references, hiring manager feedback, background check results, social profile information, activity level...the list goes on. You need all of it to get a good sense of what manufacturing skills and experiences each candidate brings to the table. Given that the average job requires a hiring manager to look at 25 different applicants (and that’s the number whittled down by the recruiter, who is likely looking at a pool of 100), having information organized is essential. When pieces are accessed separately, it’s difficult to get a holistic, accurate picture of a candidate, and how they compare to others. This can make deciding on a candidate more difficult, and prolong the hiring process. Technology that automatically imports information into one candidate profile and organizes it in an intuitive way can expedite the process. With all candidate information available in the system, recruiters can run reports on each candidate field, making it possible to quickly find which eligible candidates live closest, have passed their background checks, or have the most relevant skills on a per-job basis. Employee referrals are consistently shown to be employers’ strongest source of hire. For manufacturers, rebooting or expanding an employee referral program can be a particularly useful strategy to battle the industry’s skills draught. There’s a good chance your current employees will know of friends, family, or former coworkers with the experience and expertise you need for an open role. Asking employees to pass along a referral’s resume and contact info directly can be a much faster approach than just posting to a job board and hoping for a bite. Plus, your employees will be able to share first-hand accounts of why your company is a great place to work. 43% of companies said their best employees came from employee referrals. Yet, only 14% say they currently leverage employee referral technology. Get the most out of your employee referral efforts with technology that can automatically post job opportunities to participating employees’ social profiles. Employees can choose the frequency of these postings at the time of enrollment and then “set it and forget it”, requiring minimal effort on the part of the employee or recruiter. To encourage participation, be sure your referrals are incentivized. Let employees know what reward they’ll receive if they make a successful referral. Recruiting technology also makes it possible for recruiters to search by employees that are the most successful in making referrals. So for example, if reporting can show you that Jim generated three hired referrals in the past, you can reach out to him directly the next time you need to fill a position quickly. 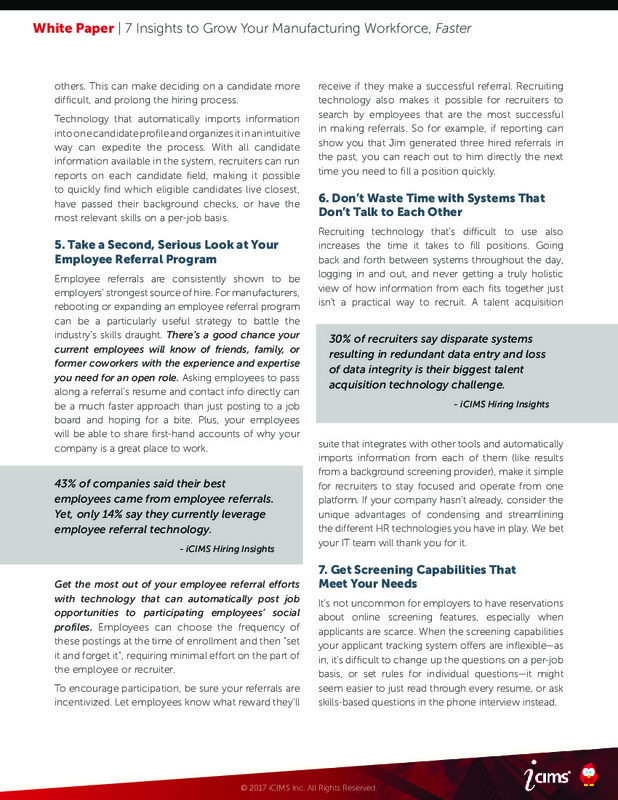 Recruiting technology that’s difficult to use also increases the time it takes to fill positions. Going back and forth between systems throughout the day, logging in and out, and never getting a truly holistic view of how information from each fits together just isn’t a practical way to recruit. A talent acquisition suite that integrates with other tools and automatically imports information from each of them (like results from a background screening provider), make it simple for recruiters to stay focused and operate from one platform. If your company hasn’t already, consider the unique advantages of condensing and streamlining the different HR technologies you have in play. We bet your IT team will thank you for it. 30% of recruiters say disparate systems resulting in redundant data entry and loss of data integrity is their biggest talent acquisition technology challenge. It’s not uncommon for employers to have reservations about online screening features, especially when applicants are scarce. When the screening capabilities your applicant tracking system offers are inflexible—as in, it’s difficult to change up the questions on a per-job basis, or set rules for individual questions—it might seem easier to just read through every resume, or ask skills-based questions in the phone interview instead. 50 to 75% of the people that apply to a job are unqualified for it. Screening matters. But technology can give employers full, flexible control of an application’s screening features, so that recruiters can save time without sacrificing quality. 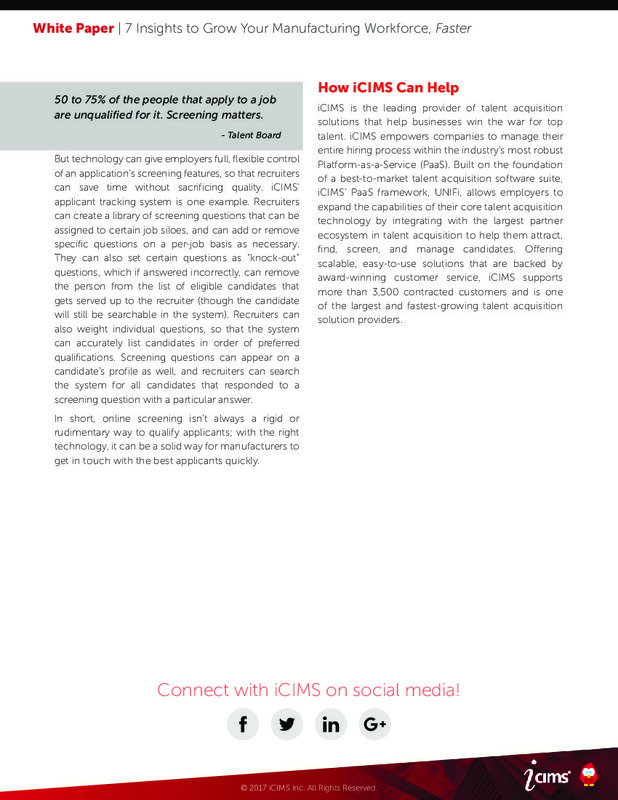 iCIMS’ applicant tracking system is one example. Recruiters can create a library of screening questions that can be assigned to certain job siloes, and can add or remove specific questions on a per-job basis as necessary. They can also set certain questions as “knock-out” questions, which if answered incorrectly, can remove the person from the list of eligible candidates that gets served up to the recruiter (though the candidate will still be searchable in the system). Recruiters can also weight individual questions, so that the system can accurately list candidates in order of preferred qualifications. Screening questions can appear on a candidate’s profile as well, and recruiters can search the system for all candidates that responded to a screening question with a particular answer. In short, online screening isn’t always a rigid or rudimentary way to qualify applicants; with the right technology, it can be a solid way for manufacturers to get in touch with the best applicants quickly. iCIMS is the leading provider of talent acquisition solutions that help businesses win the war for top talent. iCIMS empowers companies to manage their entire hiring process within the industry’s most robust Platform-as-a-Service (PaaS). Built on the foundation of a best-to-market talent acquisition software suite, iCIMS’ PaaS framework, UNIFi, allows employers to expand the capabilities of their core talent acquisition technology by integrating with the largest partner ecosystem in talent acquisition to help them attract, find, screen, and manage candidates. Offering scalable, easy-to-use solutions that are backed by award-winning customer service, iCIMS supports more than 3,500 contracted customers and is one of the largest and fastest-growing talent acquisition solution providers.